Leaving the house? Tips for packing a bag for an outing! 1 Diaper Bag – I have a great diaper bag that I ordered custom made off of Etsy. It’s the perfect size and it’s so cute that I can use it as my purse. Before we went anywhere though, I needed to go through and take all of the non-essentials out of it so it didn’t weigh me down. Diapers, diapers and more diapers – We use cloth diapers, however, for an outing like this we opt for disposables, but that's up to you. It’s just easier for us, mainly me, b/c I’m able to do a quick diaper change like I had to with Lady Bug in her infant carrier and I can just toss her diaper. We so rarely use them that I don’t feel terrible about it. Buggie’s in the thick of potty training so I had extra training pants for him too. If you were to pack cloth diapers you'd want to make sure to have extra in the event of an emergency. Pre-stuffed pockets like Knickernappies would be great and super convenient! Wet bag – I bring my Leslie’s Boutique wet bag with me everywhere, even when I’m not using my cloth diapers. It’s great for accidents in clothes and blow outs from Lady Bug. Definitely an essential for any diaper bag. Bottles – I exclusively breastfeed Lady Bug but on an outing like this I brought along two bottles with my milk. It’s just easier to feed her that way than to have to get the cover out. I feel like I don’t really pay attention to her and what she’s doing when I’m breastfeeding in public which is why I like bottles in busy public settings. Nursing Cover – I do still bring my cover, however, in case Lady Bug decides to be a girl and change her mind. That way I’m prepared. Always be prepared. Extra clothes – One long sleeved t-shirt and shorts for Buggie and a pair of pants and onesie for Lady Bug. I also brought a little sweater for her because, after all, this is Minnesota so layering is an essential part of any outdoor activity. Wipes – Even though we use cloth wipes primarily, I always have hordes of disposable wipes with me because they are great for cleaning pretty much anything. 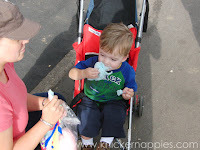 You should have seen Buggie’s face after he inhaled his bag of cotton candy! If using cloth wipes it would be easiest to bring them pre-moistened with your favorite wipe solution, and extra for those sticky situations! Band aids and ointment – You never know and hopefully you won’t have to use them but it’s better to be safe than sorry! Baby sling/carrier – I pretty much wore Lady Bug yesterday. She was a little over stimulated by the noise and lights of the Fair so this was the best way to comfort her. Plus, it’s so sweet to snuggle and wear your baby! 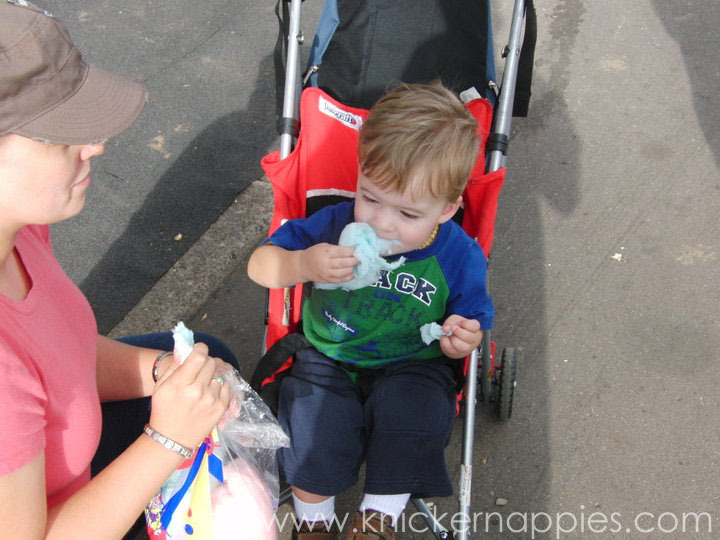 Sippy Cup – Did I say that my Buggie gets cold sores? Yeah, he does and he has one right now. He had to have his own cup for this trip; otherwise, we probably would’ve shared everything. Cold sore or not though I always bring a cup of water for him. I want him drinking water rather than needing to make a stop to get something from a machine because I wasn’t prepared. As you can see, I didn’t pack any toys or anything like that for this trip. Normally I do but when the outing is at a kid friendly place and your little one is going to be entertained there simply isn’t a need to bring that extra baggage with you. I’ve noticed (and tell me if you have too) that as a breastfeeding mom, my back is sore the majority of the day just from the weight of my “girls.” Add needing to sometimes carry a 33 lbs. toddler and wearing an 11 lbs. baby and you’ve got the perfect ingredients for a sore back. That’s why I packed light for this outing. My advice if you’re going out for a fun little family outing – bring the essentials, leaving the rest at home and be prepared for anything that will need immediate attention. Now let’s get out and experience life! Elizabeth (aka Bert) Anderson married her college sweetheart in 2005, became a "mom" to a beagle named, Chula, that same year and started her journey into motherhood in 2008 with the birth of her son. She started blogging in 2009 as a way to keep track of her thoughts on being a first time mom, especially her struggle with postpartum depression, and as a way of reaching out to other moms who are struggling with the same things. This July, Bert had another first in her motherhood travels - a little girl! Even though she's newly a mother of two, Bert maintains that no matter how many children you have you will always be a "first time mom" because there's a first time for everything! Visit her blog, at FTM. Bert is a contributor for She Thinks Media. Friday's Featured Fluff Addict is Kristin! Save your cloth diapers with flushable liners! Winner of our EcoSprout Giveaway is...Jessica S!